It is currently hurricane season for the Atlantic and Pacific regions of the United States. As I write this article, Hurricane Florence is a Category 3 storm with the potential to reach Category 4 status. As of now, the storm has an uncertain path, but East Coast folks – please watch this one closely, as some models suggest it could head right for you. Helene and Issac could form in the Atlantic later this week. In the Pacific, Hurricanes Olivia and Norman are being watched closely. Hurricanes are unpredictable, as anyone who has experienced one knows. This makes them challenging to prepare for, but fortunately, there are things you can do to increase your odds of survival, should one head for your region. It is important to understand that a hurricane need not be a Category 5 to be incredibly dangerous and cause serious damage. When Hurricane Isabel hit my Virginia neighborhood in 2003, the storm was barely a Category 1. It was the first (and to date, the only – thankfully) hurricane I’ve experienced personally, and back then I really had no idea how difficult the aftermath would be. I fully expected the “authorities” to take care of everything after Isabel passed. I thought they’d clean up all the debris and have the roads cleared and power on within a day or two. Isabel had an unusually large wind field (an example of a hurricane doing “unpredictable” things). Thousands of trees were uprooted. Power lines and telephone poles were downed all over. Hundreds of houses were damaged…many beyond repair. Hundreds of roads, including major highways, were blocked by fallen trees and other debris. The heavy rainfall caused inland flooding, which closed roads and damaged homes and businesses. We were without power for over two weeks. Because we – and most of our neighbors – did not think to purchase generators in advance, one neighbor decided to head out to buy them for us. He wasn’t able to find any until he reached Pennsylvania – every store he checked in Virginia and Maryland was either closed due to the storm or had already sold their entire stock of generators. That gives you an idea of how hard it can be to find important supplies in the aftermath of a natural disaster. In The Prepper’s Blueprint, the importance of understanding how unpredictable hurricanes can be is discussed and emphasized. This type of natural disaster is truly one of the most difficult emergencies to prepare for simply because there are so many variables to account for. These storms can range from mild to severe and can cause wind damage, flooding, and tornadoes. You can be fully stocked with provisions, but what good will that do if your home is flooded in a matter of minutes and all of your supplies are destroyed or inaccessible? Before Hurricane Harvey made landfall last year, it was predicted as merely a tropical storm or Category 1 hurricane. In fact, many living in the area did not think much of it in terms of severity and only stocked up on supplies for a few days. Within those few days, it had developed into a Category 4 with 132 mph winds. This hurricane primer has essential articles with supply lists that can aid you in preparing for a storm. Often, when a hurricane is approaching, government officials will issue evacuation orders to people in designated evacuation areas. Most governments use one of two terms when issuing evacuation notices. An evacuation order is when officials strongly encourage people in certain areas to move to a safer location. Personal discretion is allowed, but not advised. A mandatory evacuation order means that emergency management officials are ordering all people in the designated area to move to a safer location – personal discretion is NOT an option. People who refuse to comply need to understand that this kind of order means they should not expect to be rescued or given any kind of assistance once the storm has reached the area. If you can leave the area before the disaster strikes, then do so, and seek shelter elsewhere. Should you decide to stay put for whatever reason during a hurricane, adequate preparation is crucial to survival. Please check out our guide here – now, so you can prepare far ahead of the storm: Last Minute Preparedness: How To Prep For Sheltering in Place. In the aftermath of Hurricane Harvey, many found themselves in non-profit disaster shelters, and many reported conditions that were not healthy or safe for human beings, especially children. As hundreds of thousands of people packed in close proximity to one another in Houston’s convention centers, churches, mosques, and schools all serving as temporary shelters, their basic needs seemed to be met. Food, water, and a place to sleep were provided. But the danger of an infection -both viral and bacterial– and subsequent horrible illness was high. And in close quarters, these infections could easily spread sickening many in a short amount of time. There is another danger associated with spending time in a disaster shelter: sexual assault. Overcrowded and understaffed shelters unintentionally put all those who stay at them at risk. There’s no way a handful of people can monitor hundreds of others at all times. The elderly are a part of the population that is particularly vulnerable during times of evacuation and emergency. They face many concerns both before a disaster strikes and immediately afterward. Hurricane Katrina is a tragic example of how devastating big storms can be to the elderly: roughly 71 percent of the hurricane’s victims were older than age 60, and 47 percent of those were over the age of 75. Most of these victims died in their homes and communities. At least 68 (some of whom were allegedly abandoned by their caretakers) were found in nursing homes. If you are elderly or have loved ones who are, please plan accordingly. Staying at home and local shelters may not be the best places for those who have special health concerns and are not able to adequately care for themselves. Also, please don’t forget about your furry and feathered family members: take your pets’ needs into account when you are preparing for an impending hurricane as well. Prepare for the worst and make sure you can survive on your own. We cannot emphasize this enough. While the bad weather hurricanes bring usually sticks around for 12 to 24 hours, there are other dangers that often linger for much longer. As I mentioned earlier, after Hurricane Isabel struck my city, my neighborhood was without power for over two weeks. Some areas in the Hampton Roads region were without electricity for even longer. Some roads were closed for more than a week. There are five possible life-threatening scenarios that hurricane victims must understand and prepare for. Water contamination is common after a hurricane. The facilities that remove contaminants from drinking water are typically unusable if they’re inundated with floodwaters, or if they do not have the power needed to run their pumps or the ability to get fuel for their generators. The water supply could be tainted with anything from unpleasant but relatively harmless gastrointestinal invaders like Norovirus to more serious bacteria like Vibrio, a potentially deadly microorganism. Ideally, you’ll have enough water stored for you and your family. Water is a top preparedness priority. Aim for a supply of 3 gallons of water per person/day, minimum, stored in food-grade containers. If you have pets, you’ll need to make sure you have enough water for them too. Remember, while water is crucial for proper hydration, you’ll also need to use it to prepare food and for sanitation purposes. I don’t think there’s such a thing as having TOO much water stored. For more on water storage, please see Emergency Water Storage Ideas for Every Type of Disaster and 5 Short-Term Methods to Store Water. Even if you believe you have adequate water stored, be sure to learn about water purification methods and devices as well…just in case. Always ensure the safety of your water by properly filtering or boiling it before use. There are portable water filtration systems you can keep on hand in case of emergency. The Sawyer Mini Water Filtration System is one of them. It’s a compact, portable, three-part system that can be put together and placed over a drinking vessel like a water bottle. This system comes with a straw that you can use to drink directly through the filter itself. It can also be hooked up to a Camelbak water pouch. The risk of contracting an infectious disease is heightened after a hurricane, in large part due to flooding. Flood water is a perfect vehicle for pathogens: it can harbor bacteria, different viruses, and fungi – and often is contaminated with sewage and hazardous chemicals. There are numerous reasons to avoid flood water entirely. Wading through it – even if it is shallow – can cause drowning because moving water can sweep you off your feet, and can rapidly transport you to deeper bodies of water. Snakes and other dangerous creatures (depending on where you live) can lurk in flood waters. Debris could be floating in it, and could cause serious harm. And, of course, electrocution is a deadly risk – fallen power lines may have exposed the water to electricity. To protect your home from flood damage, learn how to properly create a sandbag barrier or consider investing in a system called AquaDam. If you live in a flood zone, special preparations are in order. The following articles can help you better prepare. A major risk after any hurricane, blackouts can be devastating for those without a plan. From refrigerators to cell phones, people have almost become completely reliant on electronic devices for their survival, and for this reason, a blackout can have disastrous implications for the ill-prepared. In late October 2012, Hurricane Sandy devastated the East Coast and left widespread, long-term power outages in her wake. On October 31, over 6 million customers were still without power in 15 states and the District of Columbia. On November 7, 2012, 600,000 people were still without power. After Hurricane Ike hit in September 2008, our very own Tess Pennington and her family experienced a power outage that lasted more than three weeks! The grid in New York City is still vulnerable, nearly 6 years later. But NYC is not the only part of the US that has an aging and weak grid that is susceptible to damage – much of the US power grid is vulnerable. Fortunately, there are steps you can take to prepare your family for power outages. Be ready to prepare food off the grid. Stock your pantry and bug-out bags with nutrient-dense food that does not need to be refrigerated or cooked to eat, like nut butter, nuts, seeds, granola bars, protein bars, and dried fruit. Fill up your vehicle’s tank while you still can – gas stations rely on electricity to power their pumps. Be aware that most medication that requires refrigeration can be kept in a closed refrigerator for several hours without a problem. If unsure, check with your physician or pharmacist. Have a backup plan in case your power is out longer than a few hours. Know where the manual release lever of your electric garage door opener is located and how to operate it. Garage doors can be heavy, so know that you may need help to lift it. Keep a key to your house with you if you regularly use the garage as the primary means of entering your home, in case the garage door will not open. Have cash on hand in case ATMs are down and stores are not able to process credit cards. Learn how to protect your food supply when the power is out. To be proactive, begin using perishable foods in the freezer and refrigerator to minimize food spoilage. Also, to keep items as cool as possible during a power outage, limit the number of times the refrigerator or freezer door is opened. If you are concerned that your meat may spoil, preserve it beforehand, by either the canning method or the dehydration method. Freeze soda bottles filled with water and place them in the refrigerator during outages – they will help to maintain the optimum temperature. Stay indoors and try and keep your body temperature as normal as possible. Close window blinds and curtains to keep your home cool. Turn off or disconnect appliances, equipment (like air conditioners) or electronics in use when the power went out. Power may return with momentary “surges” or “spikes” that can damage computers as well as motors in appliances like the air conditioner, refrigerator, washer or furnace. Consider purchasing at least one gas-powered generator. They require about a quarter gallon of gasoline for each hour of use. This means you will need to keep plenty of extra fuel on hand. For a blackout period lasting 3 days, it would be wise to keep at least 15 gallons stored in your house for use in your generator (or car). Do not connect a generator to a home’s electrical system. If you use a generator, connect the equipment you want to run directly to the outlets on the generator. Do not run a generator inside a home or garage. For more on safe generator use, please read This is One of the Unspoken Dangers That (Silently and Quickly) Kills During Emergencies. Leave on one light so that you’ll know when your power returns. Use the phone for emergencies only. Listen to a portable radio for the latest information. Access to fire will be critical in a blackout. Be sure to have at least three different ways to make fire, such as a magnesium and steel fire-starter, matches, and butane lighters. Lanterns will be effective alternative light sources as long as you keep kerosene in storage. Speaking of fuel, you may also want to use propane for use in a barbecue grill or for other propane-powered appliances. Having extra flashlights will make a fundamental difference during a power outage. Keep extra sets of batteries for each flashlight. If you don’t already have a first-aid kit now is the time to get one. Sanitizing gel is also a smart item to have in your supplies. A radio with a crank generator will enable you to hear emergency alerts without having to ubackup-up power. Have at least 3 days of clean clothes ready for each family member. If you live in an area where people shift into panic mode at the mere mention of snow flurries, you know that grocery stores can become a chaotic scene in the days prior to the expected weather. We rarely get snow in this part of Virginia, so when it pops up in the forecast, stores quickly run out of bread, milk, and water. As you can imagine, everyone and their second cousin will be scrambling to stock up on supplies in the days before an impending hurricane. The closer it gets to landfall, the worse the situation gets. This is why getting ahead of the crowd is crucial – to your stockpile and your sanity. Obviously, food, water, and gasoline are items that can quickly become scarce in the event of an emergency. But, there are other items that some might not think to purchase in advance of a big weather event. These include bleach and other chemical disinfectants, cleaning supplies, disposable gloves, trash bags, toilet paper, and home repair supplies. Regarding toilet paper – hurricane survivors tend to grossly (pun intended) underestimate how much they are going to need. Toilet paper is used every day and when it runs out, things can get very, very unpleasant. Why add to your misery? This is an item that is very much worth stocking up on. On average, consumers use 8.6 sheets per trip – a total of 57 sheets per day. Multiply that by a week-long storm and a family of 5 and you are going to run out quickly if you don’t buy enough. As if dealing with a hurricane isn’t enough, it can bring along a particularly dangerous partner in crime: tornadoes. Hurricanes and tropical storms are collectively known as tropical cyclones. Tropical cyclones and tornadoes are both atmospheric vortices. “A tropical storm has all the ingredients necessary to form a tornado: They have multiple supercell thunderstorms, they contain the necessary instability between warm and cold air, and they create wind shear, an abrupt change in wind speed and direction which can create swirling vortices of air,” explains 6abc. Tornadoes from tropical systems make up an average of over 20 percent of all United States tornadoes during the month of August, and sometimes 50 percent or more of all tornadoes in September, said Dr. Greg Forbes, severe weather expert for The Weather Channel. Most of the tornadoes develop in bands of thunderstorms and intense showers outside of the eyewall about 50 to 250 miles from the hurricane or tropical storm center, he said. “It’s pretty uncommon to not have tornadoes with these,” he said. Tornadoes mostly form over land, instead of over water, because the land slows down surface-level winds, creating even more wind shear, McNoldy said. Tornadoes form wherever these pre-existing supercells happen to be, he added, but meteorologists are still unable to predict exactly where tornadoes will strike. 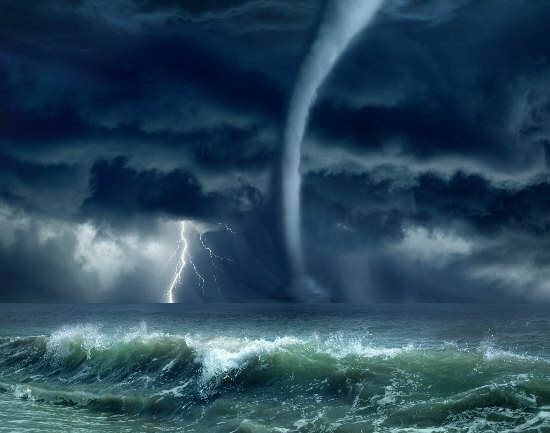 Most tornadoes occur in a tropical cyclone’s outer rain bands, about 50 to 200 miles from the center, but some have been spawned near the inner core. “In a hurricane’s outer bands, tornadoes represent a burst of concentrated destruction in an area that otherwise might not see the devastating levels of wind produced by the hurricane’s core,” according to a CNN report. Hurricane-produced tornadoes are difficult to predict – they tend to appear quickly and with little to no warning. For this reason, it is very important to pay attention to the weather and to be prepared for a tornado (or several tornadoes!) to strike. Earlier this year, AccuWeather Atlantic Hurricane Expert Dan Kottlowski predicted the United States will see 12-15 tropical storms in 2018 – of which, 6 to 8 are likely to become hurricanes, and 3 to 5 are likely to become major hurricanes. For more on hurricane preparedness, please read Hurricane Expert Warns: “Prepare for the Worst-Case Scenario”… The U.S. Could See Up to 5 Major Hurricanes in 2018. For cautionary tales and advice from people who have experienced hurricanes, please read 20 Hurricane Survival Tips From Real-Life Scenarios.